Roger Briggs’ music is praised as some of the most compelling, imaginative, and communicative music written in recent times. Winner of six international 1st place awards in 2018, reviewers continue to stress the music’s “rare power of communication” using words and phrases like: “delicate, haunting, trance-inducing”; “intrinsic appeal to the senses”; “brilliant and expansive”; “music that coaxes the imagination to unconscious imagery”; “immersion in atmosphere and color’. His music is being performed in the U.S., Canada, Europe, Japan, and South America by ensembles like the London Symphony Orchestra, the Prague Symphony, the Seattle Symphony the Cleveland Orchestra Youth Orchestra and others. He has received numerous commissions, grants, awards, and prizes for his work. He attended the the Eastman School of Music, the University of Memphis, the Dartington Institute and received top honors in composition, conducting and performance. He studied composition with Samuel Adler, Eugene Kurtz, Don Freund, and Joseph Schwantner. Mr. Briggs is Professor Emeritus of Composition at Western Washington University, Conductor Emeritus of the Whatcom Symphony Orchestra, and currently resides in Charlottesville, VA, where he has devoted himself to full time composing and part time teaching. PhD, Eastman School of Music. Internationally recognized composer and conductor. American Academy of Arts and Letters’ Lieberson Award, ASCAP Award, NEA Fellowship, Arts Council Awards from New York, Indiana and Washington State, Dartington Fellowship, 3 MacDowell Fellowships, Chautauqua Fellowship, Petit Jean International Art Song Fellowship, 3 Meet the Composer Grants, Dreyfus/MacDowell and Alienor Awards, Composer of the Year Award in Washington State, Discography of 10 CDs, Recordings by London Symphony Orchestra, Prague Symphony Orchestra, Czech Radio Orchestra, Silesian Philharmonic, Works performed by London Symphony Orchestra, Seattle Symphony, Prague Symphony, Czech Radio Orchestra, Da Capo Chamber Players, Third Angle, Fear No Music, Zephyr, New Performance Group, Pittsburgh New Music Ensemble, Buffalo New Music Ensemble. Worked with Leon Fleisher, Ursula Oppens, Jennifer Koh, Evelyn Glennie, Orion Weiss, Alicia Weilerstein, and Corey Cerovsek. Founded Whatcom Symphony Chamber Orchestra, Music by American Composers commissioning series, WWU Contemporary Chamber players, Michiana New Music Ensemble. Critics repeatedly praise conductor Roger Briggs’ performances using words like "dazzling", "vibrant" "brilliant" and "masterful". He has guest conducted in Europe and the United States, and recorded with such internationally renown orchestras as the London Symphony, the Czech Radio Symphony, and the Prague Symphony--for a total discography of six CD releases. He continues to work with outstanding guest artist such as Leon Fleisher, Ursula Oppens, Jennifer Koh, Evelyn Glennie, Orion Weiss, Alicia Weilerstein, and Corey Cerovsek. 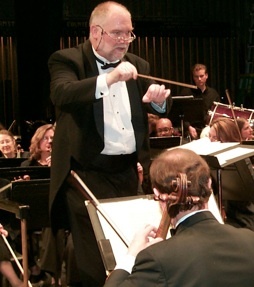 Mr. Briggs is currently the Artistic Director of the Whatcom Symphony Orchestra in Bellingham, Washington and has held that position since 1996. Under his leadership the orchestra has expanded from a community orchestra to an award winning, critically acclaimed, regional orchestra, drawing large, enthusiastic audiences from throughout the state of Washington and southern British Columbia. He founded the Whatcom Symphony Chamber Orchestra, the Music by American Composers commissioning series, the Chamber Music NOW program, and has assisted in establishing an impressive orchestral/educational outreach program in the Bellingham area. Mr. Briggs is equally at home with contemporary scores, founding the Michiana New Music Ensemble in South Bend, IN, and the Contemporary Chamber Players at Western Washington University. Mr. Briggs has guest conducted established contemporary ensembles such as The New Performance Group, Sonora, Zephyr, and Fear No Music. Composition. He studied conducting with Gustav Meier and composition with Samuel Adler, Sir Peter Maxwell Davies, and Pulitzer Prizewinning composers Joseph Schwanter and Ned Rorem. Roger Briggs was born in 1952 in Florence, Alabama. He began piano studies at age eight. By age 11 he was seriously composing and performing. At age 15, he was conducting, composing, and arranging for school, community productions, and for private performances. By the time he had graduated from high school, he had played in, conducted, and written for numerous ensembles including Concert Bands, Orchestras, Jazz Bands and Rock Bands. He was also a very active classical pianist-both solo and chamber. In 1970 he attended the University of Memphis, where he studied composition with Don Freund, piano with Herbert Hermann, and conducting with Richard Earhart. There he earned a B.M in Music Composition, a B.M in Piano Performance, won the state concerto competition performing the Prokofiev 2nd Piano Concerto, and twice won the Johannes Smit Composition Award. At age 22 he attended the Eastman School of Music where he studied composition with Samuel Adler, Joseph Schwantner, Eugene Kurtz, and Warren Benson. He studied conducting with Gustav Meier. There he earned an M.M. and a Ph.D in Music Composition and won both the Louis Lane Orchestral Award and the Bernard Sernofsky award for excellence in composition. At age 26, (1978) he was appointed Professor of Composition and Conducting at Saint Mary's College, Notre Dame, IN. There he founded the Michiana New Music Ensemble, and received his first national and international recognition as a composer with works such as the solo piano work, SPIRALS, the chamber orchestra work, GATHERING TOGETHER, and the chamber work, CHAMBER MUSIC. At age 31 he did post-doctoral work at the Dartington Institute in Totnes, England where he studied composition and contemporary conducting techniques with Sir Peter Maxwell Davies and John Carewe. During this period, he received several prestigious awards including three MacDowell Colony Fellowships, a National Endowment for Arts Composer Award, two Meet the Composer Grants, first place in both the Alienor Competition and the Illinois State University Fine Arts Competition, an ASCAP Award for Young Composers, a New York State Council of the Arts Grant, two Indiana State Arts Grants, a Dartington Fellowship, a Petit Jean International Art Song Fellowship, the Dreyfus/MacDowell Award, and he was the only honored American in the International Composers Forum hosted by the Pittsburgh New Music Ensemble. In 1989 he was appointed Professor of Composition and Piano at Western Washington University. He founded the Contemporary Chamber Players and was appointed conductor of the University Symphony and Opera Programs two years later. While there, he received a Logan Seminar Fellowship, the Washington State Composer of the Year Award, two Washington State Arts Commission Awards, the University’s Excellence in Teaching Award, and the Mayor’s Fine Arts Award. He accepted the Artistic Director post with the Whatcom Symphony Orchestra in 1996. He immediately established the Whatcom Symphony Chamber Orchestra, and later founded the Music by American Composers Commissioning Series and the Chamber Music NOW! program. He has also helped establish an impressive orchestral/ educational outreach program in the Bellingham area. His compositions continue to receive international acclaim. In 2005 he received the prestigious Lieberson Award from the American Academy of Arts and Letters. His conducting career has also receive national and international attention as well. He has conducted and recorded with the London Symphony Orchestra, the Czech Radio Orchestra, the Prague Symphony Orchestra, and the South Bend Symphony. Mr. Briggs remains Professor of Composition at Western Washington University where he serves as coordinator of the Composition Program. He remains the Artistic Director of the Whatcom Symphony Orchestra in Bellingham, WA.